Though some of us probably wanted to be famous rock stars or movie stars when we were younger, once you enter into undergrad you begin to realize that you’re not going to be the next Beyoncé or JT. Fortunately, you still have the opportunity to work in the entertainment industry and be a part of all the action. Though a job in Media and Entertainment may seem glamorous, it’s one of the most competitive industries to break into as a new hire. Here are some tips, trends, and tricks to understanding your options as an undergraduate student. One of the driving factors of the Media and Entertainment Industry, like many others, is the advent of new technology to help combat the rising costs of internet and piracy, which have caused the industry’s main revenue streams to dwindle. The media industry has remained relatively stagnant in past years, accompanied by falling purchases, and is now relying on new means of creating revenue. This includes (but is certainly not limited to) an increased reliance on music streaming platforms such as Spotify and Apple Music, as well as the integration of virtual reality software into video gaming. 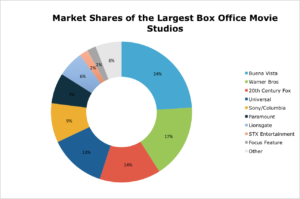 As it currently stands, the film and video industry, by far generates the most revenue of any entertainment and media sector. For the 2015 fiscal year, the industry earned about $29 billion in revenue and made an additional $420 billion in subscriptions and advertising. 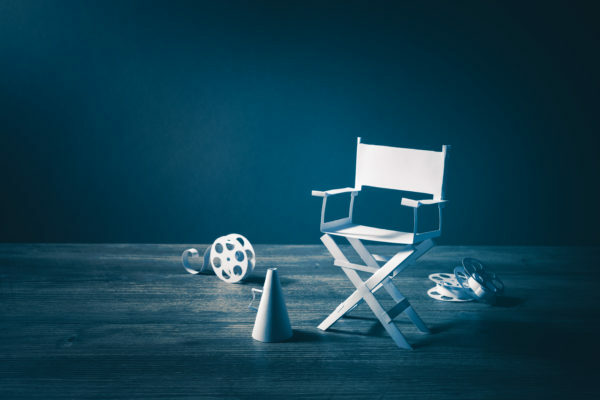 While the film industry may be raking in the big bucks overall, the median entry-level Film/TV producer makes only a median salary of about $50,000/year. The most notable corporations in the film industry include: 21st Century Fox, Columbia Pictures (which is now owned by Sony), MGM, Paramount Pictures (now owned by Viacom), NBC Universal, and Time Warner. The U.S. recorded music industry (including concerts and touring) has remained at an estimated $15 billion as of 2015, the same number it’s been at for the last three years. The four largest companies in the music industry as it currently stands are: Sony, Universal, Warner, and EMI. Undergraduate internship pay can vary vastly depending on the size of the company you’re working with. According to Glassdoor, interns at Sony Music Group, one of the largest music entertainment firms in the country, only expected an average of about $9-12/hour. In fact, Sony and some of its subsidiary companies have even been slapped with lawsuits regarding not paying their interns at all. Warner Music Group, on the other hand, does not pay undergraduate interns at all, and instead explicitly states on its application that students applying for their internships must have the ability to receive college credit for their work to even be considered for a position. With the rise of the internet and social media use, a new Pew study claims nearly half of US adults claim they get the majority of their news from Facebook. This doesn’t mean the publishing industry is completely dead yet. In 2014, the US publishing industry generated $28 billion dollars in revenue, with e-book revenue sales increasing by about 3.8%, not including books purchased through subscription based services. At the same time, this doesn’t mean the publishing industry hasn’t taken significant hits. By 2019, digital publishing will account for 45 percent of the entire sub-industry, and studies show the newspaper industry has been experiencing major layoffs, decreasing in size by over 39% in the last 20 years. Number of employees is not the only thing falling in the industry, salaries have also been in decline in recent years, with average compensation falling by almost $10,000 for both men and women since 2013. 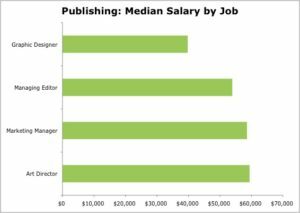 Below you can see a breakdown of the median salary per the top jobs in the publishing industry. Data courtesy of Payscale. At TransparentCareer, we’re currently gathering our own data to bring you insights personalized to your background. Women in the entertainment industry have certainly not remained silent on the issue of gender inequality over the past years- barely 25% of women hold executive positions according to a survey of 522 media companies across the US. According to a study by 247 Wall St, the information industry, which includes media, publishing, and communications jobs, ranks sixth in a list of the worst industries for equal pay for women. On average, women earn only 76% of what men do. This means, that for every $1 a man earns for a job, a woman will only receive about 76 cents for the same job. This ends up adding up to men earning a median per week salary of $1,029, while women only earn $780 per week. This is even worse than the dismal US national average of 80%. But women, don’t despair there are a plethora of new initiatives working at tackling the gender imbalance in the media industry. There are different coalitions, including the Women’s International Music Network, aimed specifically at recognizing and bringing together some of the best women in the industry. 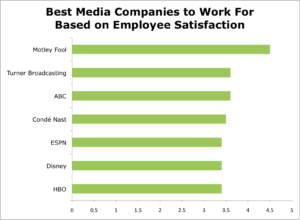 In terms of top companies and employee satisfaction, here are some of the best media companies to work for based on employee satisfaction. Data courtesy of Glassdoor. At TransparentCareer, we’re currently gathering our own data to bring you insights personalized to your background. Unlike industries such as consulting and finance, there aren’t any typical recruiting timelines and hiring methods. The best way to reach out to companies you may be interested in is to head directly to a particular company’s career website. Remember, though these are some of the most coveted and competitive jobs out there for recent grads, there are ways you can stand out, get noticed and get hired. 1) Do your research. If you’re submitting broad, generic cover letters, you might as well not submit one at all. You need to research the major works and strategic issues facing a particular firm, and frame your application in a way that shows a recruiter that you’re invested and can be a valuable asset in furthering the mission of a company. 2) Know what to expect. It’s not all roses and butterflies, especially when you’re first starting out. Check out Glassdoor, Comparably, and TransparentCareer’s Arts, Media, & Entertainment dashboard so you know what salary and hours to expect up front. 3) Network, network, network. With thousands of resumes to sort through, hiring managers at these companies need a point of differentiation to even consider you. The inside referral could be your secret weapon. Use Linkedin or your school’s alumni database to find out who’s in the industry already, and (nicely and humbly) suggest a quick coffee chat or phone call. Not quite sold on Media & Entertainment. Check out our guides on some related fields, Advertising and Marketing. Still not sure which industry is for you? Fear not, sign up for free to get more industry data, tailored specifically to you and your needs.